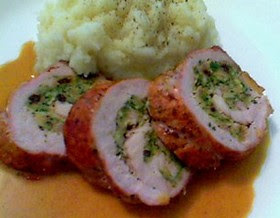 I've recently received several emails requesting stuffed and rolled meat recipes. Since I'm still getting set up here at my moms (and recovering from that cheeseburger) I thought I would re-post this dish that ran way back in February. Sometimes you just have to show off. This is one of my many recipes that looks very impressive to your dinner guests, but in fact is quite simple and easy to prepare. The cut we’re using here is pork “tenderloin” NOT a pork “loin.” This is the “filet mignon” of the pork. Yes, it is more expensive, but it’s all edible, and as you’ll see, it’s a very user friendly cut of meat. They are usually sold two to a package and weigh just over a pound each. If you’re not sure ask the butcher. Think of this demo as an idea generator, not a specific recipe. Pay attention to how the tenderloin is split and stuffed, rolled and tied, but as you watch you should be thinking of ways to customize this dish to your tastes. I’m using a very standard bread crumb stuffing with garlic, fresh herbs, and dried currants. By the way, I forgot to mention in the clip, when you sear the rolled and tied pork in the pan, place the "seam" side down first to seal this part first. My next post will cover the Dijon pan sauce I served with this pork, and soon I’ll also demo the cauliflower mash that I used as the side dish. Enjoy! 1st: I think you based this off of Ramsey...maybe? 1st: Every chef has this in their arsenal! No,it's actually from an italian beef dish my uncle does. 2nd: who doesn't love photoshop?! ...best program ever. I think George Clooney would agree. This is awesome, and I wil try it out with this filling. I have made something like it before, but with a semi-dried and feta-cheese filling instead, and then BBQed on VERY low heat..
Where does the shoemaker insult come from? I heard it through-out my time in culinary school, yet know one I asked knew its origin. Thank you Chef John, I have been looking for a recipe to impress my finance, and i think this will do great. Hey, Chef John didn't you post this already? It is me or "deja- vu". Oh well... looks yummy. :) Did you find that Kwik-E-Mart yet? They should have one especially in NY. Again Happy Birthday, and sorry I wasn't as clever as the other people. :( And thank you for your culinary expertise in these great...wonderful...amazing food clips/videos/posts. I fixed this last night for a dinner guest (guinea pig) and she absolutely love it!! She kept going on and on about how I need to be a chef or go out on my own and open a restaurant. This was a very, very good dinner. Thanks! It's on the list, thanks. Chef John, stumbled upon some of your vids while looking for "how to prep squash" on YouTube. Love your narrative style, so low key yet funny. Thanks for the great recipe videos and Happy New Year. Looks very tasty, and being tenderloin is actually not that bad healthwise. I haven't tried any of the rolled dishes yet, though they've been on my list for a while. This may be the first I try in that category. I love all your vedios I watched. You really enjoyed teaching. Made me enjoyed learning. Thank you so much. When you sear the tenderloin in the pan, is there any oil in the pan? I couldn't tell from the video. Now I can't decide if I want to do this recipe or the one inspired by the chocolate covered cherry's.... UGGGGGG... LUV your videos!! Chef, I'm going to make this very soon. I'd very much like to throw some grated Parmesan cheese in the stuffing. Do you think that might clash with the sweetness of the currants? I'm more of a savory than sweet kind of guy. I made this tonight and it was very good. I liked the addition of Parmesan cheese to the stuffing, however, I think that the cheese made the stuffing a bit too salty, so, next time, I'll reduce the salt a bit. I loved learning the new technique for tieing the roast. Also, I made the mustard pan sauce with apple juice and it was terrific. Thanks for another winner, Chef. I'm blending this recipe with the one you posted a while ago with a stuffed cherry chicken breast. I hope the combination of cherries goes as well with the pork as it did with the chicken. I'm making this today with cherries instead of currants and hope it turns out as well as the stuffed chicken breast with cherries you posted some time ago. This remains my favourite recipe on Foodwishes. So simple. So adaptable. Thanks for the inspiration and keep up the great work Chef! Wanted to find a way to complement your method and results in today's videos. Seeing this one next to today's recipes says a lot.